Having trouble locating your Low Vision Optometrist? Low Vision can be caused by a number of eye conditions including Diabetic Retinopathy, Cataracts, Stargardt’s Disease, Retinitis Pigmentosa, Macular Degeneration and Glaucoma. Depending on the cause, there are different ways for the condition to be treated. When you have a low vision exam with Dr. Shuldiner from Low Vision Optometry of Southern California, you will get years of experience to diagnose your situation. Each case is different and requires personalized care. During the consult our eye doctor will find the right prescription to help you see clearly. Consultation about the best low vision aids for your situation. Whether you want to drive, watch tv or read the newspaper, your low vision specialist will be able to advise and fit you for the devices you need. Recommendation of the most helpful low vision aids for you, such as magnifiers, prismatic glasses and telescopes. At Low Vision Optometry of Southern California we understand that someone with low vision may not be able to travel distances to see a low vision expert. That is why Dr. Shuldiner will travel to you! This saves you the hassle of having to travel far distances to get the care you deserve. 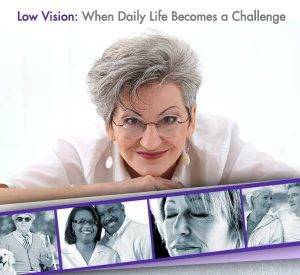 Call us at 855-966-2020, to book a time and place for your low vision consult. The first step to driving with low vision is a thorough consult and evaluation of your situation. If Dr. Shuldiner does not think this therapy will help you, he will tell you and not waste your time or money. Don’t forget that in order to pass the Long Beach DMV vision requirements, your strong eye must test better than 20/200. Looking to be fit for telescopes near Long Beach? In addition to telescopic lenses and glasses, our optometrist can provide additional tools to improve your vision. With low vision therapy close to Long Beach, additional low vision devices such as magnify glasses or computer screen enlargement, or other solutions that fit your lifestyle, our specialist is able to help his patients live life to the fullest. For more information about low vision devices near Long Beach, California read more.